The TI-30 III replaced the TI-30 II within two years and defined the end of the Slimline series started in the year 1978 with the TI-50 LCD calculator. A similar calculator appeared in Europe with the TI-30. Within one year the keyboard was slightly changed, view the later TI-30 III. 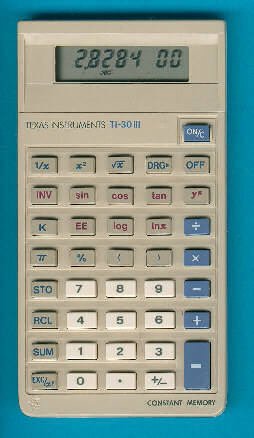 Later models used solar cells instead of the batteries, view the TI-30 Challenger. The styling of the TI-30 III traces back to the BA-III prototype and was repeated on other models like the TI-35 II, BA-II and BA-35. When production of the TI-30 III started in Italy a special version in a transparent housing was available. Don't miss the rare TI-30 III ClearCase.